Tweet In continuing to highlight elements of my friend Kristen's DIY wedding, here are a few more items from her beautiful wedding that stood out and made me smile. Twist #1) They doubled as a hand-fan. Perfect for an outdoor wedding. The DIY bride made these herself. It's as simple as sticking a painted popscicle stick between the front and the back of the program. Twist #2) On the back of every program was a velcro'd golf pencil and either a Mad Lib, a wedding crossword puzzle, or a word search. 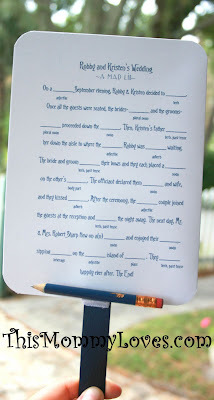 I thought this was a perfect touch for guests that arrive a little early and are waiting for the ceremony to begin. 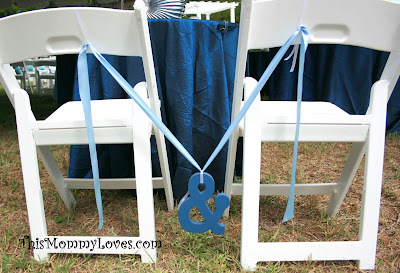 2) I love the '&' that was used to connect the Bride and Groom's chair at the reception. So sweet. 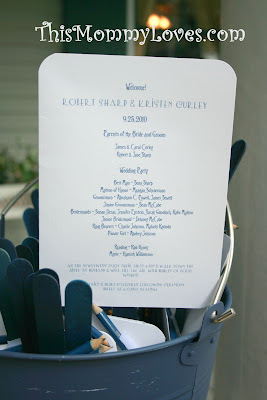 3) I was very happy to make the 'Welcome' sign that the bride hung at the entryway. She requested this after seeing my Happy Birthday Banner I did for my daughter's 2nd Birthday Party. Click here for the full banner making tutorial with Free Printable! I regularly link up at the following Link Parties.